September 20, 2018 ~ I am sitting down today to compose this web page because I suppose it is the most efficient way to solve a problem that I have noticed throughout my entire career and working life. ​Over the years, I have seen so many manifestations of it that gathering all of the examples together into a single place requires considerable effort. The more I think about it, the more examples I see. Keeping this page down to a reasonable, comprehensible length will be a challenge, but here goes. Real Estate Folk. I am addressing this page primarily to people who work in the Real Estate Industry: builders, sellers, investors, managers, and pretty much anyone and everyone else working in the space. ​I have learned that it tends to attract Extroverts who score a high I(nfluence) on the DISC personality assessment. They're strong at social face-to-face interaction, emotional intelligence, negotiation, and sales. They love to be around people, and they don't like being alone, sitting still, or being buried in details and minutiae, a.k.a. from their perspective, "Lonely Work." Disdain for Details = More Money, More Problems. As top line, large transaction, big picture people, beyond the top line, they tend to rely on rules of thumb, percentages, and assumptions. They distance themselves from pesky details by delegating to others who score differently on the DISC Assessment. Because of this distance (which amounts to a disconnect), they tend to mistake what happens to Gross Income on its way down the Profit & Loss statement to becoming Net Income, realizing smaller net incomes than they had assumed or even worse, losses. Whenever this happens, their solution is to do what they do best: pursue more gross income. But as long as they continue to remain disconnected from detail, the same vicious cycle persists: More Money, More Problems. My Introduction to Real Estate. In 2015, some real estate folks asked me to help them. By way of preparation, I read and reviewed a few books: Millionaire Real Estate Agent (2003), Millionaire Real Estate Investor (2005), and The One Thing (2013), all by Gary Keller and with some help from Jay Papasan. The above links lead to my reviews of these books, including detailed notes. Time Management - more specifically, Time Blocking, that is, setting appointments with yourself on your calendar to do important things, by yourself, just as if you had set an appointment with another person. ​What Extroverts Like . . . And Don't Like. In 2018, I attended a success seminar taught by a noteworthy individual in the real estate industry. It was a two and a half day event for which we all paid around $1,000, raising a substantial sum for a great charitable cause. I was in a room with about 1,000 people, top producers from across the country, the cream of the crop, the best of the best. They had spent significant collective amounts of time and money on flights and in the hotel, just to get that message. They were very social, very emotional; there were some tears and empathy, and they ate it up, raved about it. We all had thick fill-in-the-blank workbooks, but because of all the emoting and digression, we failed to complete them. We barely completed half. The presenter apologized, remarking how in the future, perhaps he should make the event longer. Despite this failure, the event got rave reviews. People didn't care. They got what they wanted: a chance to socialize and emote. That's what Extroverts like. They don't like books and details. That's Lonely Work. They like to be in a room with other people, relating to them. Lonely Work is for others . . . .
. . . Or is it???? ​Ironies. Do you see the ironies in all of this? 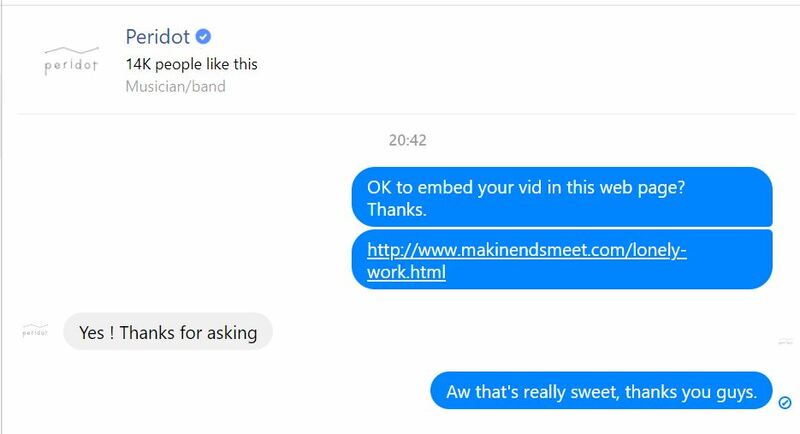 Going to a group event, to be advised to do individual work? Charging extroverts substantial sums of money to be advised to do things they don't want to do, to do what introverts would do naturally without having to be told or charged? Failing to complete the curriculum, yet have the event be pronounced a resounding success anyway? If it were an actual school, how could that ever happen??? ​I don't know about you, but I find these ironies quite thought-provoking. It really got me thinking about the whole phenomenon of "Conference Junkies." ​I wonder how I can position myself in relation to them to be of the greatest help to the greatest number of people. This web page is one attempt to do precisely that. "Lonely Work" is one way to describe it . . . that is, if you're addressing a room full of extroverts . . . and I feel that, in that case, the presenter was very clever to describe it that way because he understood his audience. He understood that they thought of it that way. He understood they don't want to do it. But notice: he did NOT advise them to distance themselves from it or delegate it. He advised them to get over themselves, and do it anyway. 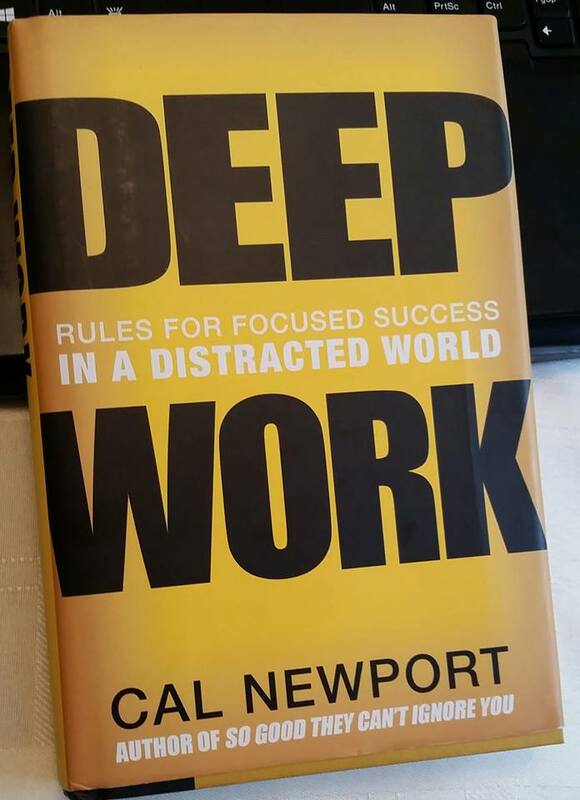 Another way to describe it is, "Deep Work." That's what author Cal Newport did. ​As you can see from the Table of Contents, it's a simple book. Newport published it in 2016. In April of 2018, I read it in a couple of days. 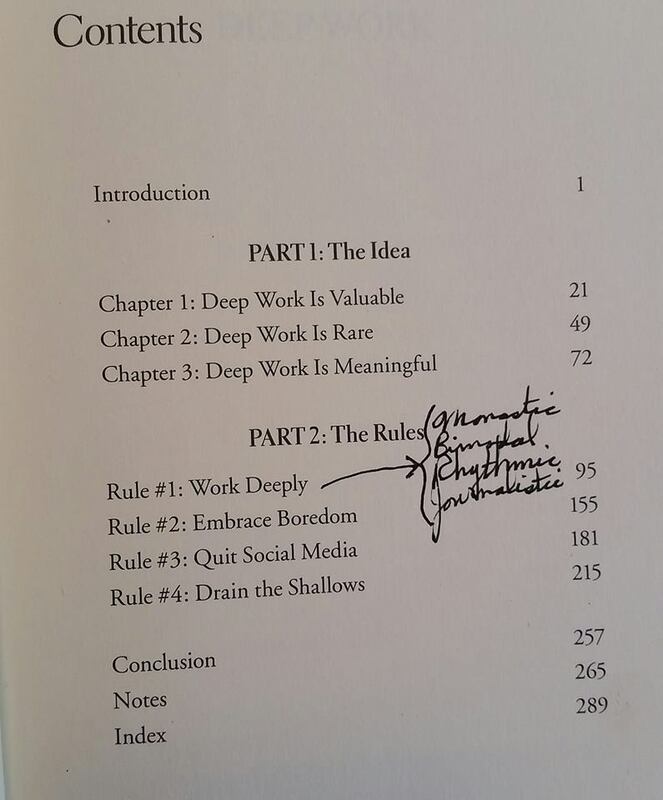 From the Table of Contents, we see that Deep Work is valuable, rare, and meaningful. Work deeply, embrace boredom, quit social media (except my Facebook page, of course), and drain the shallows. And if you can't read my handwriting, four ways of working deeply are Monastic, Bimodal, Rhythmic, and Journalistic. Why Is Deep Work Rare? ​It's rare. Ponder that a moment. Why is it so rare? For one thing, Newport discusses the error of open floor plans. From the below articles published since his book came out, it's obvious the verdict is in. Open floor plans are a vast mistake, an abject failure, a profound case study in the hazards of Groupthink. Imagine all the decision makers across the country who approved of these floor plans, who are now suffering the embarrassment of having been so demonstrably wrong. This collective error in judgement, and waste of resources spent on such a bad idea, is truly astounding. Beyond Newport's book, for myself, I can offer my own additional observations having to do with Multitasking. Another reason Deep Work is so rare is because our work environments are structured to encourage us to multi-task. Computer operating systems. They're designed to let you run many applications at the same time. Computers weren't always that way. Before we had the Graphic User Interface (GUI) that we now take for granted in both the Apple and Windows environments, and now on our smart phones, you could only run one application at a time. Multi-tabbed Internet browsers. Regardless whether you're using Chrome, Firefox, Explorer, Safari, or whatever, they all let you view many web sites at the same time. Social media news feeds like Facebook, Twitter, and LinkedIn. The streams of activity that we see in these places are incoherent. They are not connected to each other in any way, except for the fact that we chose them. The only thing they share in common with each other is the user. Scattering & Gathering . . . "Un-Reading" versus Reading. Compare and contrast this third point with a book. In this sense, even though we may "read" what we see insofar as it's print that we view with our eyes, it is not reading in the sense that it is coherent, that's it's related to itself, that it has a gathering effect on the mind. I think of such "reading" as "un-reading" because it scatters the mind, whereas real reading gathers it. It is almost as if, to heal from the damage we suffer when we scatter our minds "un-reading" on social media, we need to read something coherent to re-compose ourselves, to re-gather our minds . . . kind of like gathering anything else that has been previously scattered. The Reality About Multitasking. In their book The One Thing, Gary Keller and Jay Papasan drive this point home, pointing out that Multitasking never works. It fails every time it's tried. People who believe they're good at multitasking are flat wrong. They don't know what they're missing . . . namely, the advantages of Lonely Work, of Deep Work. They're lost in the shallows. They're totally missing out. They're shredding their minds, living a perpetually scatterbrained, beastly existence. They're missing out on the opportunity to be truly human. ​Making More Money. They're also missing out on the chance to make a lot more money. For example, real estate agents who don't do Lonely Work make average mid-five figure incomes. Their real estate "business" is nothing more than a glorified job. Real estate agents who do Lonely Work operate real organizations, and make millions. It's a slam dunk. It's a no brainer. Lonely Work is the right thing to do . . . not just for so-called "Introverts"; it's the right thing to do for everyone, everywhere, always. So what IS Lonely Work, exactly? If Lonely Work makes the difference between an ordinary income and an extraordinary income, what are some specific examples of it? Reading a book to the point of not just familiarity, but mastery. Grokking it. Making it a part of yourself. Writing business documentation (see my review of Sam Carpenter's book Work The System). Writing business plans and budgets. Getting your Accounting together so that you can confidently haul money like you'd haul water with an intact bucket. Getting your Customer Relationship Management (CRM) database together and using it as it was designed to be used. Doing AppDev (Application Development) and BizDev (Business Development) to handle deal flow and work flow, and help your business become scalable. Planning things like long term financial goals and Lead Generation. Taking Keller's and Papasan's advice to time-block, setting appointments with yourself in your calendar, just as you'd set appointments with others. If Lonely Work is so vital, if it makes such a difference on income, why do people resist it so much? What gives? Well, thinking is hard. And if you're an Extrovert, it feels lonely because you really do have to do it by yourself. No one else can think your thoughts for you. I suppose also that being an Attention Deficit Disorder Extrovert is cool, fashionable. It's the way the Popular People were in high school. The Introverts were the nerds, socially awkward, shy, immured in the library or hiding behind their books and science projects. But news flash: we're not in high school any more. It's time to mature, develop beyond the habit of gregarious inconsequential small talk, become authentic, and do things that matter. The research shows how truly successful real estate professionals are not transactional; they are relational. They develop deep authentic bonds with people who know, like, and trust them. Take to heart the lyrics in the song Lonely Work embedded above, starting at 1:19: "The room is full of strangers I'll never see again: temporary friends with lavish lives and empty eyes . . . ."
Does this not describe the transactional real estate agent? ​If it describes you, ask yourself what you must do to make the shift from being transactional to being relational. I'll give you a couple of hints: you have to really care about people, and tool up with a good CRM & use it consistently to remember them and put that caring into practice. I'm here to help. For example I research and deploy CRMs. But I've experienced first hand the push-back that happens, of doing all the work of setting things up, only to have the client drop it. It's like the old saying: "You can lead a horse to water, but you can't make it drink." So I've come to appreciate, over time, what I can and can't do. I can help people learn what Lonely Work is, and prioritize what Lonely Work they should do first, but I can't do it for them. If I do it, it's mine, not theirs. They need it to be theirs. Do It, Or You're Fired. I'm at the point in my career now where I'm considering using appreciation of Lonely Work as a major client filter. I'm considering firing those who aren't willing to do it, and in the future, only accepting those who are clearly willing. When they're reluctant to do Lonely Work, their reluctance doesn't just hurt themselves. It also hurts me, because what's good for them is good for me, and vice-versa. That's how we structure our agreements. Just Do It. So this is my appeal, my exhortation. Please do what's good for you. I don't care whether you think you're an Introvert, an Extrovert, or whatever. In the final analysis, it doesn't really matter. In the final analysis, all that really matters is deeds. If you're reluctant to do Lonely Work, get over yourself. Just do it, or you're fired. Regardless whether I fire you . . . regardless how patient I choose to be with you . . . if you refuse to do Lonely Work, in effect you're firing yourself by all the income you won't get. Cut Yourself A Break: It's An Uphill Battle. Remember to cut yourself a break. As Cal Newport shows, it's rare. And as I've shown, our work environments . . . the stupid open floor plans, the tech that encourages multitasking, the brain-scattering social media newsfeeds . . . they all hinder it. We have to fight. We have to swim upstream. In view of these conditions and habits, it's an uphill battle with which I am available to help you. But I can't do it for you. I can only help. You must do it. If you're not ready to do it yet, do some soul-searching and fix what's wrong. Give the person in the mirror a firm talking-to. If you are, please contact me, and we'll get to work.